Telephoto view through rain of Sacré-Cœur from the top of the Eiffel Tower. 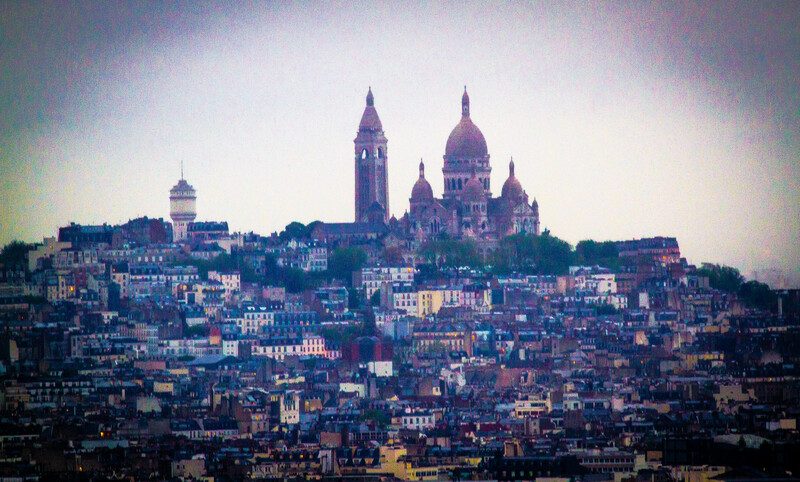 This entry was posted in London & Paris 2013, Travel Photos and tagged Basilique du Sacré-Cœur, color, Eiffel Tower, France, Montmartre, Paris, rain, Sacré-cœur, Sacre Coeur Basilica, soft focus, travel, travel photography, view. Bookmark the permalink. Grateful that my Latin helped me translate since I know very little French. What a view! Oh! I’m so glad you know the very special meaning of this very special basilica, Darlene! Gorgeous shot!! I love the walk up Montmartre to Sacré Coeur! Thank you! Ah, yes!!! Have you taken the funicular up or walked ALL those steps? We walked up the side stairs that are twisty, turny. We’ll have to take the kids up the funicular. They would love that. I walked up the stairs, too. It’s a lot of work! Yes, the funicular is on my list, too!